Create a summery mango papaya scented sugar scrub with this sugar scrub making project. This summertime sugar scrub is a pinky orange, and scented with mango papaya fragrance oil. 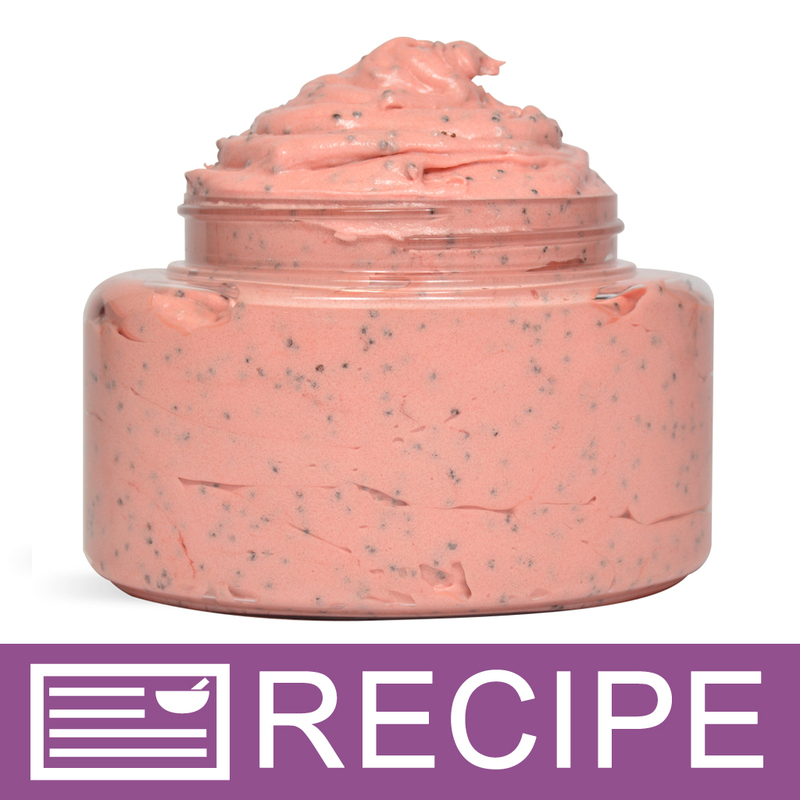 Customers will love the exfoliating characteristics of this scrub made possible by the sugar and poppy seed additives. The finished product is packaged in eight-ounce clear oval jars with black dome caps. You Save $16.65 by purchasing this kit rather than buying the items separately. COMMENTS: Very easy to whip together. The smell is amazing and the feel of the scrub isn't oily like some. I will buy this again! "Are there pre-made labels for this scrub? If not, why are there labels for some but not others?" Staff Answer We recently started designing labels for all our new recipes. At this time, we have not created labels for our older recipes. "Does this scrub still bubble/foam when used? If not, could adding bubble up or slsa help? I'm looking for a recipe for a scrub with foaming bath whip that still gets bubbly/foamy when used, but i like the idea of adding the additional moisture as well. I have tried the sugar scrub recipe that uses FBW and MP soap, but not quite in love with the finished texture. " Staff Answer Since the Foaming Bath Whip is the base used in this recipe, it will definitely bubble when used. You could also add Bubble Up to give it even more lather. "what can be used instead of apricot kernel oil? " Staff Answer You can choose any other type of oil you wish to use. "The recipe calls for 8 oz of Macadamia Nut Oil, but the kit only provides 2 oz. Why the discrepancy?" Staff Answer The recipe actually calls for 3 oz. of Macadamia Nut Oil and the kit includes (2) 2 oz. bottles so the kit is accurate. "Can this be used on face?" Staff Answer Since this is a sugar scrub, it is a milder exfoliant and can be used on the face. "What can I use in place of macadamia oil?" Staff Answer Jojoba oil would be a good replacement. "Can soy beads be used in this formula in place of the poppy seeds and if so how much please. Thanks"
Staff Answer Hi Natalie, we anticipate this would be an awesome substitution! We have not tested it, and recommend testing in a small batch. The recipe calls for 5 Tablespoons of Poppy Seeds. That would be a good starting point, but you may want to adjust it more or less depending on your preference. "I would like to make small samples with this scrub kit. Which jar do you recommend I purchase for a sample?" Staff Answer The size of your sample will depend on how you intend your client to use the sample. If you just want then to be able to feel the product and just try by washing their hands, then a one ounce sample would be sufficient. If you would like them to experience a one time full body scrub, then we would suggest a 2 oz. sample. The clear basic jars would be a great choice. They are available in both the 1 ounce and 2 ounce size.